Anatolia Islamic Centre is proud to organize Karate Classes with Instructor Raafat Elfeky, Third Degree Black Belt with over 40 years of experience in Karate and Martial Arts. 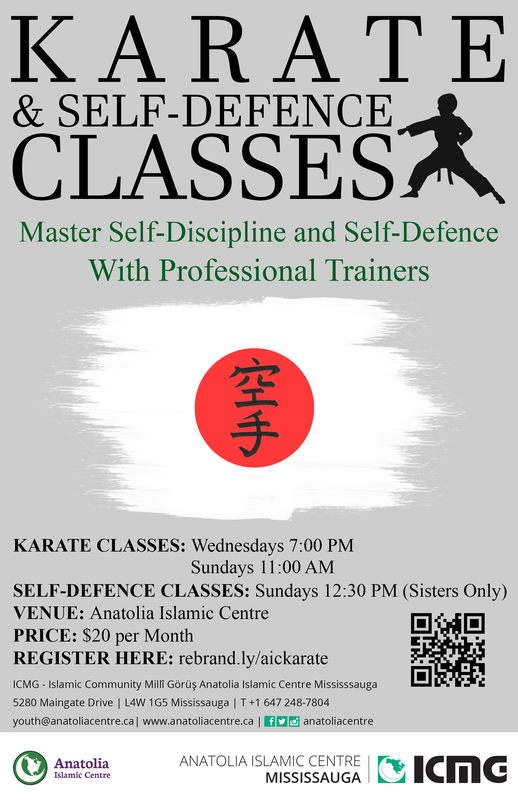 Anatolia Islamic Centre is further proud to organize Self-Defence Classes for sisters age 10 and above. The classes are taught by Instructor Kanako Isobe, Third Degree Black Belt, who is a Canadian national gold medalist in pattern performance (Kata). This program is designed to teach Shotokan style karate which includes fighting techniques, self-defence, development of speed and strength in step-wise levels. The courses are taught by instructors Raafat Elfeky and Kanako Isobe. The philosophy of the training is based on self-discipline, perfection of character, faith, excellence, respect and refrain from violent behaviour. Our instructors have practiced karate since their early ages and have participated in various championships at both national and international levels. Started Karate in 1972 in Cairo Egypt with Sensei Hideki Okamoto the chief instructor of the middle east (JKA) until 1976. Resumed training with Sensei Hidetaka Nishiyama in National Karate Institute in Los Angeles, California, U.S.A from 2003 to 2005. Attended Karate classes in Caltech Institute in Pasadena California U.S.A with Sensi Randi under Sensi Tsutomu Oshima (Shotokan Karate of America) from 2003 to 2005. Moved to Montreal Canada and trained with Sensei Melarie Taylor under Sensei Mori (JKA-SKD) from 2006 to 2008. Moved to Toronto and joined World Class Karate Dojo, training under Sensei Ray Tio, Sensei Stan Tio and Sensei Ed Leung in 2008 until Present. Achieved the rank of Nidan in 2011 from Sensei Saeki. Achieved the rank of Sandan in 2016 from Sensei Saeki. Participated as a competitor in National Championships in Egypt and Provincial Tournaments in Canada. Participated as an organizer in National championships in Egypt and Provincial Tournaments in Canada. Was a member of the board of directors of provinces of Cairo And Giza Karate zone of the Egyptian Karate Federation. Kanako is a Karate instructor with a background of Kinesiology. She is a 3rd degree black belt. Kanako started training in Karate at the age of 6 and has been competing in national level since she was 8 years old. She is an Canadian gold medalist in pattern performance (Kata). Another passion of hers is fitness and health. She has worked with a variety of population (youth athletes to older adults with medical conditions) as a personal trainer. She is passionate about helping clients of all ages and abilities reach their fitness potential. She is certified through Canadian Society for Exercise Physiology (CSEP-CPT). She also specialized in rehabilitation conditioning, and Karate (and martial arts).